A measles outbreak has been linked to Disneyland, California. There are now 9 confirmed cases, 7 in California and 2 in Utah, and all visited Disneyland or the California Adventure Park between December 15 and December 20, 2014. Only one of those infected was full vaccinated (two were too young to be vaccinated). 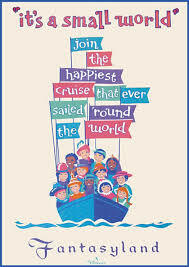 The health risks of measles aside (pneumonia, ear infections, and miscarriage and stillbirth for pregnant women) and the cost of the direct medical care, each case of measles must be meticulously evaluated requiring a lot of paper work and person-power by public health officials. Because measles is so infectious a lot of people have to be contacted and then all these contacts need to be interviewed and evaluated. Vaccine records have to be reviewed, many will need blood tests to see if they are immune or not, some will need to be quarantined, and many will also need post-exposure prophylaxis. If someone with measles was on an airplane, or went to school, or a hospital while infectious they could have exposed hundreds of people. And of course if they were at Disney they could have exposed tens of thousands. So how much does all this cost? Well, in 2011 a measles outbreak in Utah of 9 cases (just like the current count from Disney) cost the department of public health about $300,000 (roughly $33,000 per case). The amount of work that went into containing that outbreak was staggering and involved tracing 12,000 contacts, tracking down 5,521 immunization records, blood work on about 100 people, 396 doses of post-exposure prophylaxis, and 184 people were quarantined. The costs don’t include missed work for the people quarantined. 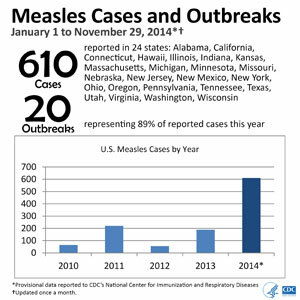 Even before this most recent measles outbreak 2014 was on track to be a banner year (a bad thing) for measles in the United States with 610 cases reported in the first 11 months. Adding the 9 additional cases that we know about from December this takes the costs of tracing contacts and preventing further infections to well over $20 million for 2014. That’s a lot of money to spend on a disease that was once eradicated in the United States. Over to you Dr. Bob Sears and Ms. Jenny McCarthy…. « What ingredient specifically scares you in the flu vaccine and why? I’m 100% supportive of vaccines (give me all the meds please!) but I have a question – you said one of those infected was fully vaccinated. How is that possible? Does that mean vaccines aren’t always effective? Vaccines’ efficiency varies from 60% to 99%, depending on the vaccine type, the fitting of the strains in the vaccine with to wild strains actually roaming around you… The flu vaccine tends to be on the lower end (especially when the flu strain has become a bit different, as it seems to be the case this year), measles vaccine on the high end (95% or more, don’t remember exactly). But now, consider this: in this measles outbreak, there was so far one vaccinated case and about 8 non-vaccinated cases. A ratio of 1 for 9. Measles vaccination is quite common in our western countries, about 85-95% of children got it. So unvaccinated people are present at a ratio of roughly 1 for 9 (maybe around your place it’s closer to 1 for 7, or 1 for 10 – it doesn’t matter, my point still stands). The un-vaccinated represent about 1 in 9 in the population, but got hit 8 in 9 by measles. I like the idea of a simple medical treatment dividing by ten my risks of getting sick. Math fail on my part, it’s even better than this. 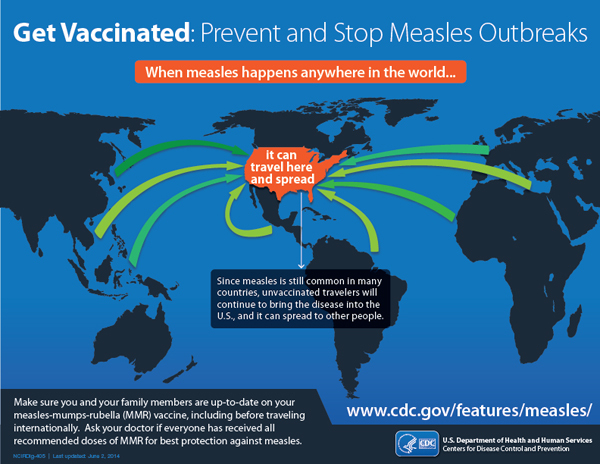 The benefit of measles vaccination is that it is actually dividing by about 1:100 the risk of getting measles. Dr. Bob Sears in Orange County should address this issue, but he won’t. (see your other post) That’s why posts like yours and mine are important. We have to keep spreading the word and hoping these mothers and fathers finally listen. Even my daughter hesitated with the vaccinations for her children because of reading Sears. And her father, my husband, is immune compromised. But they can’t see the forest for the trees. My son and I have annual passes to Disneyland but didn’t get to go for the month of December. He’s been vaccinated and is on the spectrum but I don’t attribute that to vaccines at all. Thank you so much for writing this. 1:9 is pretty significant. Elsewhere, I responded to an antivaxxer who asserted that measles vaccines make people *more* likely to catch the disease, quoting a Natural News article (to which I will not link) which justified this based on (misinterpretation) of actual peer-reviewed research in reputable journals. One example given was of a 1984 measles outbreak in a school where “all 400 students were vaccinated”. Since everyone admits that the vaccine is not 100% effective (especially the earlier versions that were given in the 1970s through early 1980s), why would anyone be surprised about this? But nonetheless, Natural News provides this as an argument for antivaxxers to bolster a claim that vaccination increases the chance of contracting a disease. They can do this because most people are really bad at statistics (hence the success of casinos and government lotteries). Let’s take a hypothetical population of 2001 students, of which 2000 are vaccinated and 1 is not, and expose them to measles. For this example, assume that the probability of contracting the disease is 1% for a vaccinated person, and 50% for an unvaccinated person. So, the 1 unvaccinated person has even odds of escaping the disease, while it is very likely that at least 20 of the 2000 vaccinated people will get sick. So, it would not be surprising if the unvaccinated person stayed healthy, and only vaccinated people got sick. But if you had 2000 unvaccinated and 1 vaccinated, the vaccinated person would have a 99% chance of *not* getting sick, while the expectation would be that *~1000* people would come down with measles, one of whom would likely get encephalitis resulting in permanent brain damage or death (not to mention the risk of a few dozen having other complications such as pneumonia, or permanent deafness and blindness).